Samantha Brand founded the SOUL Roc Foundation back in 2015. She was named the 2014 Haiti Player of the Year and that sparked something in her. She needed to do MORE. She had the help of so many people to create avenues for her to connect with with Haiti in a whole new way. Sam started on the Haiti Women’s National Team back in 2010. It was right after the earthquake and her and a dear friend Kimberly Boulos just wanted to help the Women’s National Team from their little apartment in San Francisco. The coach, Gaspard D’Alexis handed them an opportunity that was hard to believe when he asked them to not send equipment to the team in need, but to send themselves and tryout for the Haitian Women’s National Team. They took a leap, no a FREE FALL of faith and haven’t regretted one second of it. A few years down the line in 2015 and three HWNT coaches later, Sam wanted to give back to the community who believed in her. So she started the SOUL Roc Foundation. SOUL stands for Sharing Our Universal Language. You see, soccer is a language of it’s own and has taken Sam all around the world. Now she uses it to connect soccer players all over the world with youth players in Haiti who just need a chance to shine. That’s her SOUL Purpose. 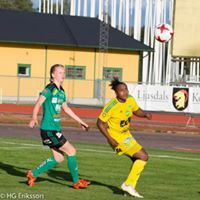 Sam is currently playing professionally in Sweden and using her platform to connect Swedes with the kiddos of Haiti. Last year her club, Ljusdals IF Dam donated over 50 soccer shoes and soccer balls to a youth soccer school in Haiti. This season she can’t wait to top that! Read more about Ljusdals IF HERE!